Heather Coronado fires to the plate in her first appearance in the circle for the Bulldogs. She got the win as DeSoto rolled over Dunbar, 20-5. Libby Wilkinson slides into third with a first inning, run-producing triple. Wilkinson led the Bulldogs with three RBIs in the 20-5 win over Dunbar. Every once in a while it is good to have a team like a Dunbar on your schedule. They’ve been struggling to build a good softball program and have taken their fair share of lopsided losses. Last week’s 20-5 loss at DeSoto was another one added to that record. A game like this gives the Bulldog hitters a chance to work on things that they need to do and also helps them focus on getting better. It also just feels good sometimes to score a lot of runs and win a district game. This game gave the DeSoto starting pitcher Heather Coronado the opportunity to start her first varsity game in the circle. She had pitched a couple of games for the JV team, but this was her first effort as a varsity pitcher. Coronado was involved in a horrific car accident just before her freshman year at DeSoto County. She was unable to play ball until this season and has fit in well with her teammates. She also got the win, leaving the game with a 10-5 lead after two innings of work. “My arm was getting tired,” said the Bulldogs’ lone senior. The Bulldogs scored in each of the four innings of the mercy run rule contest. They picked up eight in the first as they sent 11 batters up. They only had two hits but were helped with six walks issued by the Tigers pitchers. The big blow was a triple by Libby Wilkinson to drive in a run. She scored on a wild pitch just as several other players did during the game. They padded their lead with two in the second on three hits and broke the game open in the third with seven runs. The Bulldogs again sent up 11 batters in the inning and had three hits and were helped with three walks. 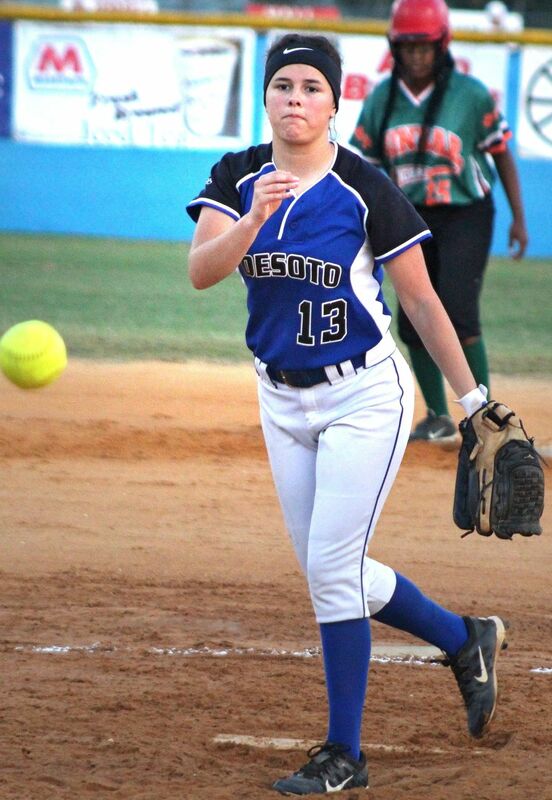 DeSoto ended the game with three runs in the fourth with just three hitters coming to bat. Jocelyn Villarreal led off with a double for her third hit in the game. Bri Tew singled and Wilkinson knocked in Tew with a double. She scored on a wild pitch to invoke the mercy-run rule and give the Bulldogs the win. “This game was what it was. They don’t have a lot of athletes so it gave us a chance to work on a few things, but we will face a lot of better teams later this season,” said Bulldog coach Keith Wallace. It was a fairly clean game, as the Tigers had two errors to just one for DeSoto. Everyone in the DeSoto lineup scored at least once and all but one player got a hit as the Bulldogs knocked out 13 hits in the game. Wilkinson led the team with 3 RBIs, while most of the runs scored on nearly a dozen wild pitches and passed balls.